Sewing costumes is quite different from sewing couture! 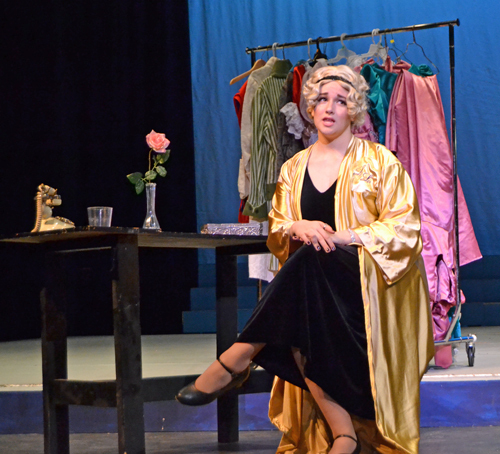 Linda Teufel shares some insights gained while stitching costumes for a local high school production of Singing In the Rain. 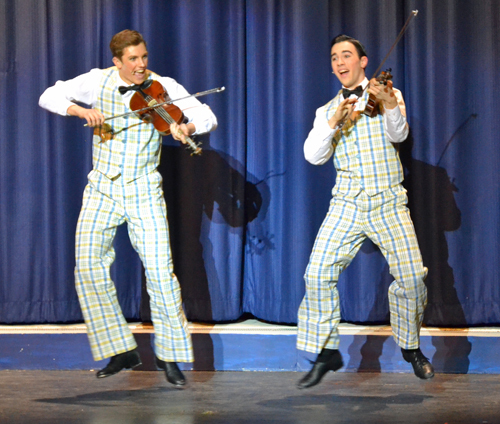 We are lucky to have a very strong theatre program in our local public high school. It was started 25 years ago by a dynamic couple who produced nine shows a school year – that’s one per month! Quite a feat but always successful. The high school has over 2300 students so there is a lot of talent to choose from. My oldest son helped with the tech/set building part and my younger son was also an actor so we went to every show. During his last year I volunteered to help with costumes and have stayed after he graduated. I really want to use my sewing skills to help wherever possible. 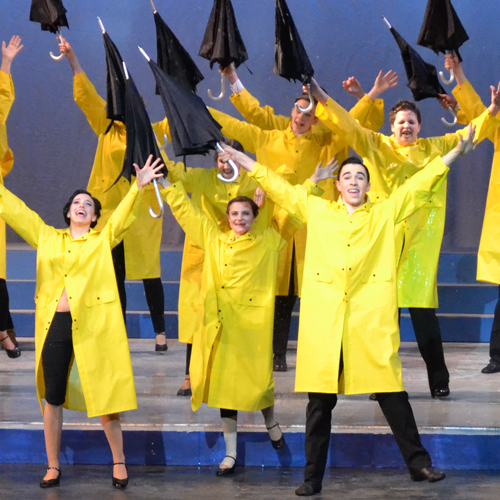 This year, with a new director and technical person, they took on the ambitious task of producing Singing in the Rain on the large, full-size theatre stage with actual “rain”!! 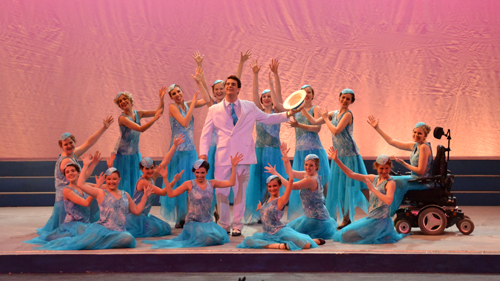 There were over 30 in the cast and many dresses to make for several musical numbers. The costume director, Bev, is a genius and has been doing this for over three decades so she knows our extensive costume library and is a great designer. We had a team of four of us making dresses, bowties, armbands, headbands, and scarves for the cast. They’ve never had so much help – it’s usually just the director! I don’t know how she did it for so many years. I am used to sewing couture or tailored garments from the finest fabrics…these were just the opposite, so I learned a lot. First of all, almost everything was a knit fabric for easy fit and for ease of sewing since we could just cut off for the hem with no finishing of edges! Also, we needed to think about possible size adjustments the next time it is worn, so we have large seam allowances and use long stitches. Since there were several large dance numbers I made the same dress over and over, which was faster. These fringe flapper dresses took about a half hour each to make. I used a narrow, long zigzag stitch and engaged the dual feed foot attachment; construction was fast and smooth with no puckers! These turquoise dresses were for the song “Beautiful Girls,” which was my favorite. I made the base sheath dress and then another mom sewed in the cut pieces of chiffon at an angle and just cut off the bottom to fit the height of the girls! One trick I learned here was how to keep the neck facing down without stitching all around the neckline with an ugly row of stitching. Bev told me to smooth down the facing and then just stitch through on a few of the glitter design lines around the neck and it is invisible! All the pink skirts are just a yoke with elastic casing waist and two half circles sewn to the bottom. It is a relief not to hem a half circle! They were worn over purchased leotards. Fabric was glued over buckram hat bases by another talented mom. Lina Lamont, the star of the show, needed her monogram on her dressing robe which was easily done on my BERNINA 830. It had to be large so it could be seen from a distance. Also I had to stitch it on a patch of fabric so it could be removed if we needed the robe for another show. Many of our costumes are remodeled and recycled as needed. And lastly, I always do the buttonholes since Bev’s machine doesn’t do them well. I love to do buttonholes on my BERNINA because it is so easy…set it once and it just keeps repeating. I needed to do fifteen each on three vests! I like the feature where you place your button on the screen and dial until the screen button matches the size of yours…that makes it more exact than entering a number in millimeters! I think one of the key factors to look for when buying a machine is the buttonhole feature. Even if you don’t make many, it is a good indicator of the ease and quality of a machine. Other than these main garments, there were dozens of hems, buttons, seams, scarves and shawls, and basic alterations that needed to be done, too! 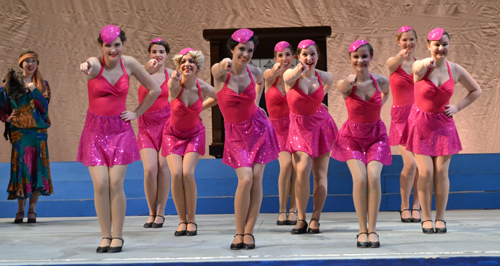 We did two shows and the rain worked and it was all a big success, selling about 2,000 seats! 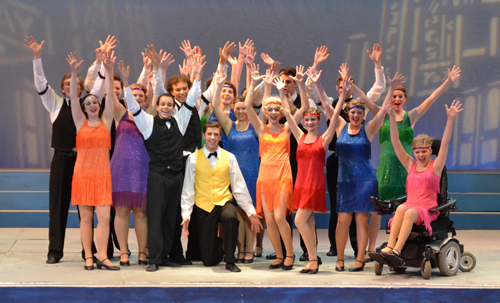 What I loved was seeing the students that I know tap dance, soft shoe and sing like professionals! They are so dedicated and put so many hours into rehearsing. It is a joy for me to help and be a small part of it!